Champion Taekwondo Penticton, formerly ValleyWide TaeKwonDo Academy, has been fortunate to have superb quality instructors to help us with all our students over the past several years. Their knowledge and dedication has been, and will continue to be a great benefit to both young and older students alike. 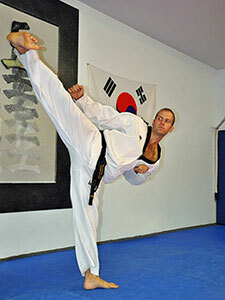 Master Mike Adams began his Taekwondo training in 1990. He has had the privilege of training under many great Masters and Grandmasters. He holds Black Belts under Master Chong Han, Grandmaster Carl Tate Jr., and Grandmaster J.Park. Master Adams currently holds the rank of 5th Dan. After competing for several years in Taekwondo tournaments, in 1997, Master Adams began teaching in Penticton at Valleywide Taekwondo. Over the years Master Adams has coached students to both provincial and national Taekwondo championships. Always eager to learn and compete, Master Adams began training Mixed Martial Arts under No-Gi Brazilian Jiu-Jitsu Black Belt David Lea. In 2002, Master Adams began fighting in professional MMA, from which he retired in 2015 to spend more time with his family and his school. Being involved in the Martial Arts most of his life, Master Adams has benefited from the positive impact the Martial Arts have made in his life. They have not only taught him self-discipline and respect for himself and others, but has allowed him to achieve a level of fitness and health that he would not have been able to obtain without it. One of his major goals is to teach his students about the true characteristics of a Martial Artist, respect, courtesy, perseverance, discipline, and indominable spirit. Michele has been studying Taekwondo since 1997. She currently holds Black Belts in Taekwondo under Grandmaster Carl Tate Jr. and Grandmaster J.Park. Nicknamed "the Iron Woman" by Master Adams for never missing a day of training, Michele's passion for Martial Arts motivates and brings out the best in the students she instructs. Michele instructs the Little Tigers class, doing an amazing job of bringing out confidence in shy students and focus in high energy kids. Always looking for a challenge, Michele has taken an interest in teaching Taekwondo to children with disabilities. She truly believes ANYONE can benefit from Martial Arts training. 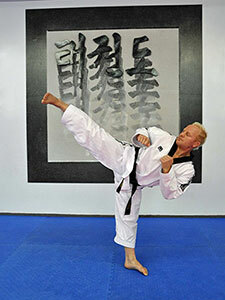 4th Dan Black Belt under Grand Master Carl Tate Jr.
Shane Crawford began his Taekwondo training in 1995. He has greatly benefited from training under both the ITF and WTF styles of Taekwondo. As a student, Shane embraced his competitive spirit and attended several tournaments and accumulated many medals and trophies. Drawing from his competition experience and knowledge of both Taekwondo styles, Shane has been passing on his wisdom as a Champion Taekwondo instructor since 2010. Shane possesses a well-rounded Taekwondo style with his biggest strength being his perfection of technique. This attribute is not only apparent in his movements, but in the students he teaches and coaches as well. Shane successfully attained the rank of 3rd Dan in the Summer of 2017 and now has his sights set on completing his 4th Dan Master Instructor Certification. As a lifelong Martial Arts student and instructor, Shane continues to learn and adopt new training methods which he shares with his students.